The more I pay attention in the Bay Area the more I’m noticing it’s a place of extreme poverty. 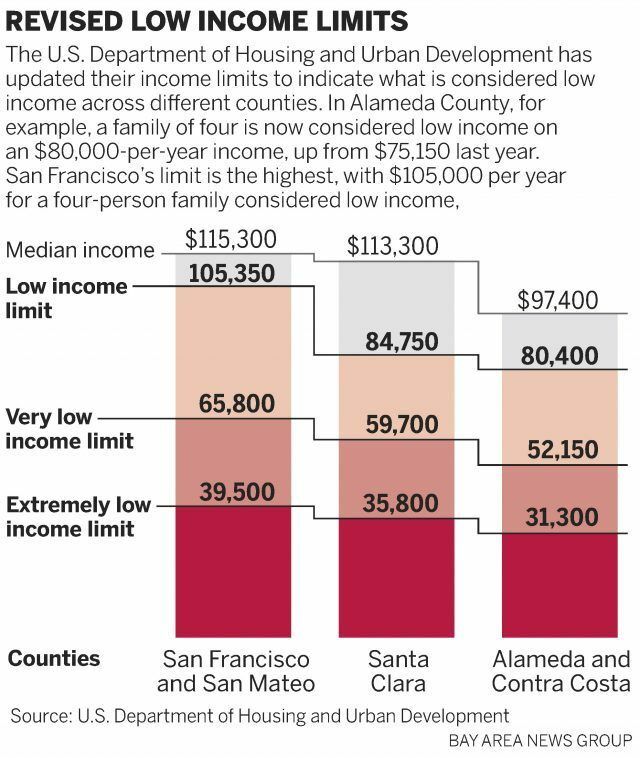 Much of the East Bay is extremely poor. The South Bay is largely poor. The North Bay quite poor (on the east side). Altogether the Bay Area is around 7 million people, and within these vast areas of poverty there are basically a number of rich areas. Mostly the tech areas. San Francisco. Mountain View. Palo Alto. Foster City. Marin County. And a number of small areas spread around. I’m guessing around 2-5% of the actual geography and population has a salary that lets them live comfortably (somewhere around 150-200K for a family), and that seems to be supported by numerous recent articles. For everyone else, what you have is working class people making very little money while living in one of the most expensive places in the world. If you just just work hard, everything will work out. Don’t worry about all that fancy college stuff, that’s not for you. Just work constantly, start a family, and everything will be ok.
It’s heartbreaking to watch people walk over that cliff, work lunchbox in hand, smiling because they’re being good citizens. Anyway, driving around the Bay Area is surreal. I am from Newark (next to Fremont), but am now living in San Francisco. If I drive just around 5 minutes south of SF, I’m instantly in a very different place. The crime rates skyrocket. There is garbage all over the place (well, that’s in San Francisco too). And you generally have no energy in the people. Why? Because they’re fried. They work 2-3 jobs, making no money, and basically look forward to getting home and watching TV until their next shift starts. Of course that’ll be a shift that is as long as possible, as unpredictable as possible, and hopefully (for the company) isn’t enough hours to require that they receive benefits. So you basically have millions of zombies, roaming around the Bay Area, going from low-paying job to low-paying job, working exactly when they’re told, how they’re told, and who are not planning at all for their futures (other than having kids to take care of them). You’ll know you’re in these neighborhoods because they’ll be full of check cashing businesses, dollar stores, cheap Chinese food, fast food, etc. The malls are full of discount shops trying to liquidate something. No high end stores. No bookstores. There is trash everywhere. The conversations are all about how they’re being beaten down by the daily grind, and you doubt they even know that automation is coming for the jobs that they still have. It’s just sad. So I keep driving, and I eventually end up in Foster City. There’s a small amount of stuff right there by the water. Lots of Tech. Visa. Decent shopping, etc. So, it looks a bit more healthy. But it’s tiny, really. And the areas around it are just like the ones 5 minutes north or south—poor. So then you drive out of that area heading south. More of the same. Working class poverty. Run down cars. Run down people. People working way too much for way too little. Garbage everywhere. No colleges. No bookstores. Just car title shops and places to buy alcohol and nicotine. Then you get to the tech area (Silicon Valley) at some point. Mountain View. Menlo Park. Palo Alto. Etc. Oh, this must be the thriving bay area I’ve heard of. Everyone’s on fire. Fast-talking. Vibrant. Energetic. Smart. Busy. The job pays well, but they’ve got 12 other things going on at the same time. Their kids come out of the womb with a college acceptance letter. Not because they’re entitled one, but because the parents have been planning it since 4 years before they got pregnant. This area is full of colleges. Bookstores. Coffee shops. High-end shopping. Apartments that virtually nobody in the United States can afford. 3-4K for a single bedroom. Keep going down and you end up San Jose. Keep in mind this is just a few minutes drive away. There are nice areas throughout, but much of San Jose is indistinguishable from a slum. Much of the infrastructure is decayed to the point of looking like a third-world country. I’ve been to many, and the similarities are unpleasant. Come back around up to the north and you end up around Newark and Fremont, which is where I’m from. Newark is working class poor. The energy has been sucked from it by jobs that pay virtually nothing after taking every waking moment from those who work them. Fremont has some promise, but only because it has a chance of becoming a small green zone. And green zones only represent “promise” if they’re options for everyone, not if they’re a tiny oasis in the rest of the world. Heading north from Fremont is basically an exercise in hopelessness. Hayward, Oakland, San Leandro, Richmond, Vallejo. They’re all poverty stricken and broken. The hills areas are always 1% types with tons of money, but the only real green zones I see out in that area are maybe in Dublin, Pleasanton, Moraga, etc., but I honestly don’t know much about those areas because I seldom get out there. Minus the rent levels, green zones represent the America that we thought we had. It’s the Bay Area we thought we had. But to 95% of the Bay Area this isn’t where they live. It’s where rich people live. So what we have is an extremely poor bay area, with a number of microclimates of the educated and highly-paid spread throughout. We have 90% of the Bay Area working for low wages and not getting an education or gaining skills that will lift them into the next socio-economic class. And then 10% of the bay area lives in very few places, with the best jobs, the best infrastructure, and all of their kids are going to college to probably make more money than their parents do. I drive around this Bay Are that I was born and raised in, listening to books about the trends that are coming. Trends around work. Trends around technology. Trends around income disparity. And I see it. I’m watching it in realtime, as I gain an increasingly vivid picture of where it’s going. A while back I wrote The Bifurcation of America: The Forced Class Separation into Alphas and Betas. This is what I’m seeing happen to the Bay Area. I’m seeing a big red zone with tiny little green zones inside of it. The red zones full of Betas, and the green zones full of Alphas. And I’m worried about what the borders to those zones will soon look like. I’m worried that within 10-20 years there will be strong measures that keep red zone types out of the green zone, due to security problems that will arise out of the separation and disparity in opportunity and benefits. At some point people are going to get tired of being bused into the green zone to clean and build, only to be shipped back out to the red zone where they can afford to live. I can’t see any degree of harmony coming from this much separation between the classes. And I don’t see any force in our immediate future (other than a world war) that can keep it from happening. I wish people could see what I think I’m seeing. Or that I were wrong in some way. But I don’t think they want to, and I don’t think I am.